Some 45,000 people die each month in Congo as the world's deadliest humanitarian crisis has failed to improve despite five years of relative peace in the Central African nation, according to a report released Tuesday. 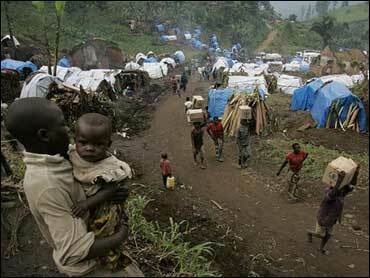 An estimated 5.4 million Congolese died between 1998 and April 2007 because of conflict, most from the rampant disease and food shortages stemming from fighting, the report said. The study found that life is still alarmingly precarious for Congolese despite the end of the 1998-2002 conflict that pulled in armies from half a dozen surrounding countries, and the country's first free and fair elections in more than four decades in 2006. "When war ended in Congo there was the same level of dysfunction without the violence," said Les Roberts, a Columbia University professor who helped conduct the first surveys in Congo with the International Rescue Committee. The study was conducted by the IRC and Australia's Burnet Institute, which researches epidemiological disease. Congo's monthly death rate of 2.2 deaths for each 1,000 people - essentially unchanged from the last survey in 2004 - is nearly 60 percent higher than the average for sub-Saharan Africa, according to report. The vast majority of deaths were from nonviolent causes, such as malaria, diarrhea, pneumonia or malnutrition, the report said. Outbreaks of easily treatable diseases like measles and whooping cough have been a major killer of children in Congo, a nation the size of Western Europe. The groupThe figures cast a shadow over ongoing negotiations for a peace deal between warlords and the government in Congo's long-volatile east. The country's hilly eastern region, long the source of turmoil in the country of 66 million and still plagued by fighting, was one of the few to post a decrease in its death rate compared with the previous survey. Richard Brennan, one of the study's lead authors, said he believed the reduction was related to a beefing-up of U.N. forces in the region and increased funding by humanitarian agencies working to stem the threatening public health disaster. The fighting has forced some 800,000 people to flee their homes in the last year. On Monday, the government and representatives from armed groups active in eastern Congo had said that they had agreed in principle to the deal to end decades of conflict and expected to sign the document by late Tuesday. But the plan faltered during discussions over last-minute amendments that dragged on into Tuesday evening. "The consultations will continue because there have been disagreements concerning amendments to the text," said Sekimonyo Wamagangu, a spokesman for the conference. He said the groups hoped to find a compromise Wednesday. According to a draft agreement made available to reporters, a cease-fire would take effect in eastern Congo immediately upon signing. The draft also provides for a U.N.-monitored buffer zone between various armed groups and government forces, the logistics of which would be worked out by a technical committee to be established. The militia fighters also would be given amnesty from prosecution for insurgency or acts of war, but not for war crimes or crimes against humanity. Even if the deal is signed, and held to, the statistics point to a tough road ahead. "It's going to require years of engagement from the Congolese people, the Congolese government and the international community," to reduce deaths, Brennan said.